You had me LOLing fo real with your Vanilla Ice references and my husband called it solid! I love this idea and will definitely be trying this. I’m too lazy to make coffee twice in a morning so I usually get whatever is leftover in the pot after my husband leaves. If the kids sleep in a little that means the coffee is lukewarm and has to be reheated – this solves my problem! Might be good in adult beverages like a White Russian as well! …and it’s dairy-free too! I’ve seen people make coffee-flavored ice cubes for iced coffee, but these are nice because they add a little creaminess and flavor. Just because you quoted Vanilla Ice, you are now my favorite blogger in the whole world. I still know all the words to that song and every so often just because I can, I sing it. Me too. I freaking love Vanilla Ice. Have you seen his movie, Cool as Ice? Because you really need to. We are clearly kindred spirits. I like to quote that movie sometimes and I’m the only one who gets it. Because, like, 10 people have seen it. I understand completely. I quote it and get stared out like I have 3 heads because I am the only one laughing. anyway, I have never thought of making flavored ice cubes, or even heard of them to be honest! I think they are worth giving a try! Ha! I’m so glad I wrote this post. Finally I know I’m not alone in my Vanilla Ice obsession. I’m making these right now. 🙂 except no almond milk, just regular bc that’s all I have. Is almond milk lactose-free? Okay, now you really have to tell me how they turn out–I’m curious how regular milk will work! Yup, almond milk is lactose-free. I’m not vegan, but I don’t like the taste of dairy milk. How did these turn out with regular milk? I’m thinking I may use regular milk or cream. I guess that would be cream ice, then instead of ice cream?? ha. Curious to know if yours were good! Those are SO pretty & sound super yummy! I made some Crystal Light ice cubes the other week & they were good in theory but since they’re mostly water anyway, they still watered down my drink & there wasn’t enough flavor to make it taste good. Definitely trying these! Yeah, the great thing about these is that they don’t water down the flavor at all! Oh my, Vanilla Ice sounds so delicious. Thank you for the amazing recipe! I put these in a nice cold mug of Chocolate Stout last night. All I can say is AWESOME!!! Totally trying this. Glad to hear you liked them! This is awesome! I have to admit though, I’m a little disappointing that these won’t wax a chump like a candle 🙁 Great blog!! Well, it might wax chumps like a candle–I haven’t tested it, though. This is brilliant!!! Love the idea!! I am going to go make some now…cant wait to have them in my iced coffee!! If you don’t have vanilla beans can you just use vanilla extract? I am going to try this with splenda to make it sugar free as well. Thanks so much …this sounds awesome!!! Ohhh i was so excited when I saw this but had no vanilla beans on hand, so I opted for my unsweetened vanilla almond milk, truvia and vanilla extract! I LOVE iced coffee and have been putting the vanilla splenda packs in it each morning and I think this is going to be perfect to replace those without watering my iced coffee down when the ice melts! it tasted good when I mixed it all up so we’ll see when I try them in the morning 🙂 I never even thought to make something like this, did coffee iced cubes before though! Thank you! I might sound totally ridiculous by asking this, but I’m gonna ask anyways. Where can you purchase vanilla beans? Somewhere like Walmart? And are they expensive? Not ridiculous at all! My regular grocery store sells them in the spice/extract section. If yours doesn’t, you might be able to find them at a gourmet shop. There are different kinds grown in different parts of the world, so the price varies. I always buy the cheapo ones. 🙂 But you can also omit the vanilla bean and just use extract instead. Start with one teaspoon, taste it, and add more if needed. 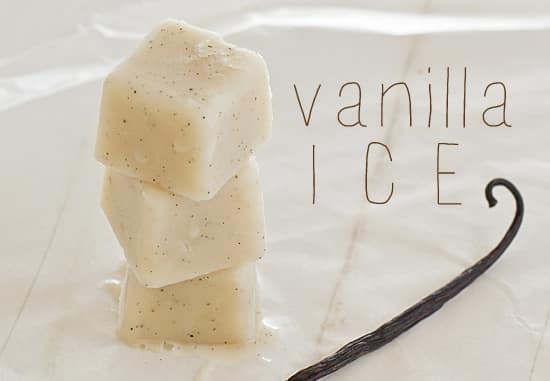 Ohh this looks so yummy and I have a special love for vanilla! Oooooh, this is perfect for my iced coffee. Thank you!! I mentioned this in the post, but maybe I should put it in the recipe itself! Yup, it works without sugar too. 🙂 I figured in coffee, most people would want to add some sweetness, but if you don’t or if you’re putting it into already sweetened drinks, you can omit the sugar. Redaing this I got one of those “now why didn’t I think of that” moments…I hate watered down drinks, what a perfect solution! Thank you! I can’t stand watered down drinks either–I never put regular ice cubes in anything! Vanilla almond milk isn’t strongly flavored enough to work in this. When you freeze the ice cubes, the flavor & sweetness dulls a little bit and then when it melts into the drink, the flavor needs to be more assertive too. So I made these yesterday and when I put one in my iced tea today, it didn’t dissolve but instead turned into floaties. It still tasted really good once I got past the idea of voluntarily drinking something with a sea of white specs sloshing around in my glass. lol The only thing I changed about the recipe was I used 2 teaspoons of vanilla since I didn’t have any vanilla beans. Any idea what I did wrong? As I mentioned in the post, when the ice starts melting into the drink, you need to give it a stir so the almond milk & vanilla mixture distributes evenly into the drink. Because almond milk is heavier than coffee, iced tea, etc, it doesn’t always mix in on its own like ice cubes made out of water. I’m not sure about the white specks though–it could be the brand of almond milk you used? I’ve used this in iced tea a lot and never had that happen! I kept trying to stir it in but it just made it worse. I used Blue Diamond Almond Breeze. What brand do you use?